I'm struggling to achieve what seems like a quite easy thing. I'm running a Windows 10 Laptop installed in English. I live in Germany, so Country or region (Settings -> Time & Language -> Region & language) is set to Germany. My Display Language is set to English (United States). As I use a hardware keyboard with US layout, but still need to type some German stuff, I have two keyboard layouts added to the input language - US (default) and German. So far, so good. But I recently started learning Russian and now I need to practice typing. 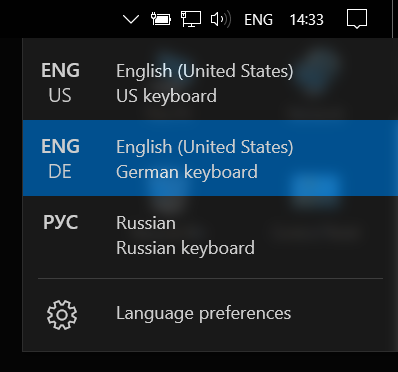 I can't add the Russian keyboard layout to the English (United States) language - it simply doesn't show up in the list. To add the keyboard layout to my hotkey switchable keyboard layout list is all I want. When I add Russian as a language it is obviously being ignored by the keyboard layout switch hotkey, since it's a completely new input method instead of just a keyboard layout, so it keeps switching between US and DE only. Can someone help? Many thanks in advance! Keep in mind that spell check is dependent on input language, so you won't be able to use spell check in Russian or German. If you do need spell check in these languages setup three input languages as JosefZ stated in a comment. Not the answer you're looking for? 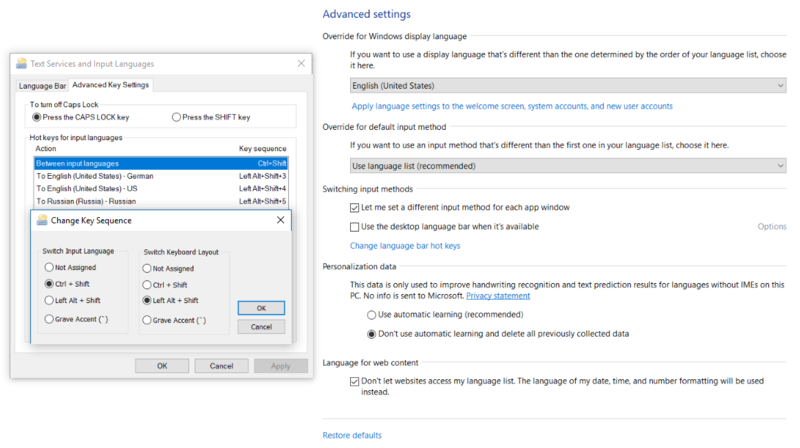 Browse other questions tagged windows-10 keyboard-layout input-languages input or ask your own question. Is there a way to use three keyboard languages, having two of them being switchable with a keystroke and the third one to be enabled by a hotkey? What's messing with my default input language?